Mattresses are meant for sleeping. Standing and sitting on mattress can damage it. Proper usage can prolong the life of your mattress. There are days when you don’t want to step out of your bed and stay there as long as possible. This is because most of us develop a hidden relationship with our mattress; for you it has become an ultimate place to find solace and relief from the pain of hectic daily life. Not to mention, if it happens to be a rainy day, you won’t care to open your eyes even if the world is crumbling around you. Like any other of your favorite things, you want your mattress to last longer. But have you ever wondered why and what can damage to your beloved mattress. So, before getting under those comfortable sheets, stop doing these three mistakes with your mattress to prevent it from getting spoiled. Its fun to jump on your bed, but you know what, it has not been designed to serve as a trampoline. Agree, we all have done this when we were kids; but you can’t keep doing the same now that you are no longer a child. 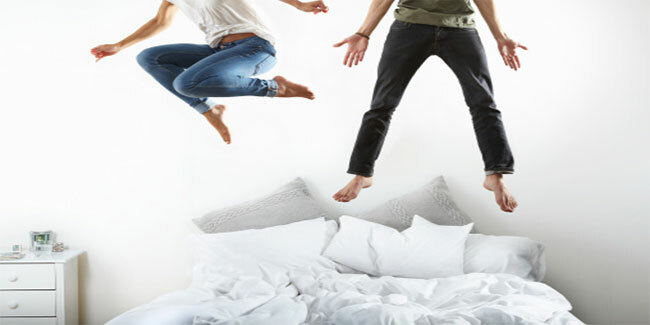 If you really want your mattress to last longer, don’t stand on it, let alone jumping. And, that’s because when you stand or jump on your bed, your body weight gets focused on one point of the mattress, which causes it to strain and sag. There is nothing as bad as a bed with potholes. We all have been there and done that! Haven’t we? We all had ended up sitting on the edge of the bed instead of taking the bliss of using a flawlessly adequate chair present right next to the bed. Thinking why you shouldn’t be doing that? Well, when you sit on the edges time and again, it causes the mattress to sag around the edges. So, instead of ruining your bed, invest in couple of steps and make use of that chair. Do you use your bed as a dining table? Well, chances are more that you have spilled or may spill beverages on it. Leaving your mattress wet can make it breeding ground for bacteria and fungus. Any form of liquid should be not be left untreated on the bed, clean the area and put your mattress in sun to dry, but is it not always much better to avoid doing such damages to your bed in the first place? Therefore, eat and drink, where you are actually supposed to. As they say, prevention is better than cure! It’s in your hands to protect and make your mattress last longer, so you can have more blissful sleep on it. Have a good night pals!